TAK EAWAY #3 from “The Power of Feedback”: If students cannot immediately do something with the feedback, research shows you are wasting your time giving it. 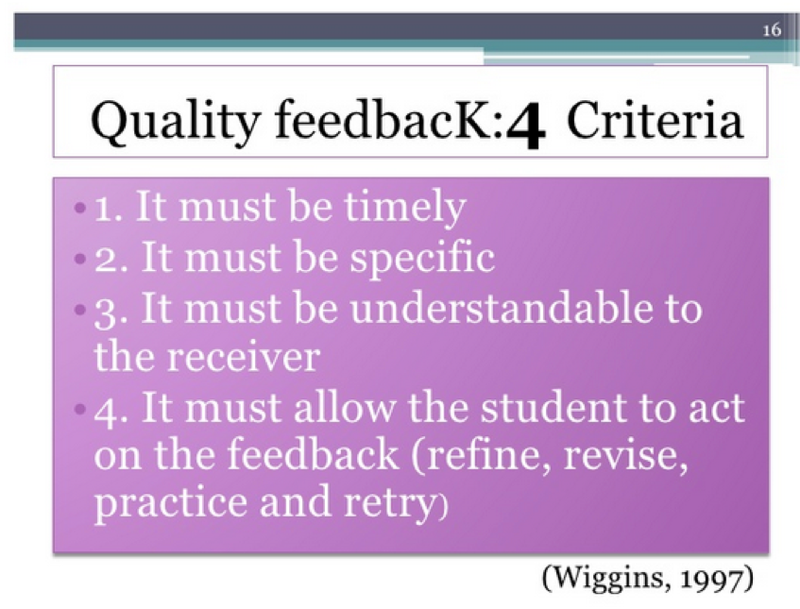 Due to a variety of factors–the finite time we have to cover a unit, the way we were taught, our own innate ability to connect knowledge and skills–we often give feedback and expect students to apply this feedback the next time. We say things like, “This should help you in future essays” or “You have to learn to stop repeating the same mistakes.” These statements are NOT wrong. Such connection making is critical to a student’s success. On a practical level as well, we need to move on to new material…and so we do. Research argues, however, that if we want to engage in effective practice with maximum impact, we must stop moving on. We should stop; go back; and re-teach if we are interested in improving mastery. Cover less. Teach more. Certainly, students who can make connections from one essay to the next do improve, but if we are interested in helping as many students as possible achieve, we are more successful when we create situations where students are responsible and accountable for immediately processing and applying the feedback. Now, if you read that excerpt and understood it perfectly, stop reading this post. Just go directly to The Power of Feedback. If you struggled with this excerpt, let me offer my interpretation. As I am first learning new German vocabulary, immediate correction of mistakes seems to help me learn faster. (Thank you, Duolingo!) Yet, as I try to build this new vocabulary into my natural speech patterns, instant corrections on my mistakes will slow me down and cause angst. (Stop correcting every one of my mistakes, please, my well-intentioned German co-workers.) I spend too much time second guessing my article endings, and my fluency suffers. Yet, after I have achieved a higher level of mastery with this vocabulary and attempt to use it as I write a reflection on my own work, immediate feedback would give me greater benefits. If I applied this trend to a student learning comma rules, I might give them online quizzes which instantly score themselves as the student learns the rule, but as the student writes a first draft, I could ignore the errors (or just circle some and let the student hunt for the rest when she revises the piece). Yet, after she has displayed sufficient mastery of the rules, I might have her teach another student, while I listened in. While doing so, I could correct any misconceptions in the moment, as the students work, and such immediate corrections would benefit all the students. TAKEAWAY #4 from “The Power of Feedback”: A classroom culture that values failure and encourages revision will make feedback more effective. I despise this cynical cliche, especially when coming from the mouths of teachers, “Well, you can lead a horse to water, but you can’t make it drink.” Rick Wormelli has a great response to this old saw, “As teachers, it’s our job to hand out salt licks!” The research shows us we can (and should) take direct actions that make learning more effective for everyone. “The climate of the classroom is critical, particularly if disconfirmation and corrective feedback at any level is to be welcomed and used by the students (and teachers). Errors and disconfirmation are most powerful in climates in which they are seen as leading to future learning, particularly relating to processing and regulation” (Hattie and Temperley 100). In other words, if we want to tell students they are doing something wrong–and we want those same students to reply, “Oh great! I chance for me to improve!”–we have to work to display and nurture a growth mindset in our classrooms. We have to create places where excellent mistakes are celebrated. Again, common sense and big data show us that students typically only give answers when they are relatively sure of the correct answer. Fostering a climate where failing is welcomed and celebrated can improve the likelihood that corrective feedback is received and used. As a writing teacher, the area in which I am currently struggling to apply this research is how revision is incorporated into classroom work. This graphic from elireview.com is a touchstone for me. I am working to move toward the “Better” image. I have the “Typical” image down cold and need to unlearn it. I will dedicate a future blog post to the specific work I have been doing to move toward the better allotment of class time. In this pursuit I find myself pulled back to the methods I learned during my student teaching in a classroom that was modeled around Nancie Atwell’s workshop approach. What is probably our best tool to create an environment which celebrates mistakes and risks is our individual relationships with students. I am paraphrasing a sentiment I have encountered in many different ways throughout my career, and it is one that always rings true in my heart: a student will not learn from a teacher who does not show him or her love. “… the thing that really matters in feedback is the relationship between the student and the teacher. Every teacher knows that the same feedback given to two similar students can make one try harder and the second give up. When teachers know their students well, they know when to push and when to back off. Moreover, if students don’t believe their teachers know what they’re talking about or don’t have the students’ best interests at heart, they won’t invest the time to process and put to work the feedback teachers give them. Of course, we don’t need to read reams of research to understand that if students truly believe we care about their success, they will respond to our feedback more effectively. Yet, as I grind away at the time-intensive chore that is providing meaningful feedback on student writing, it’s uplifting to realize that big data supports my best practice. I am also motivated to stop wasting my students’ time (and my own) with ineffective feedback. I’ll continue to read and research and explore this topic…and share my findings with all of you. Please share your best practice ideas in regard to feedback, too. I’m sure we all want to learn as much as we can. Read more of from Robin Neal’s blog here.